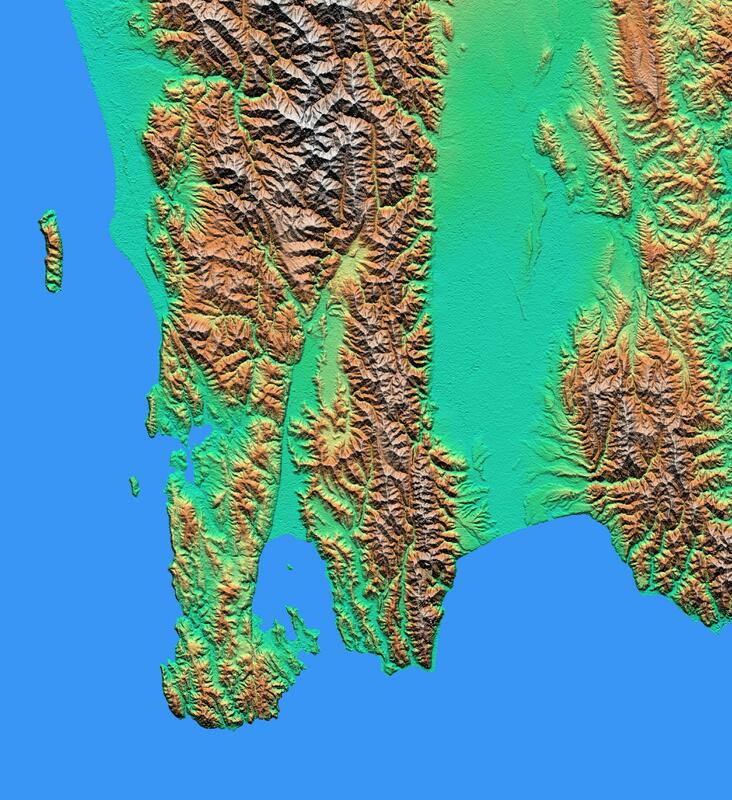 The topography of New Zealand's North Island is rich in seismic features: The sharp line cutting through the city of Wellington (on the left side of the large bay on the bottom coast) is the active Wellington Fault, which also goes through the official residence of the Prime Minister of New Zealand. 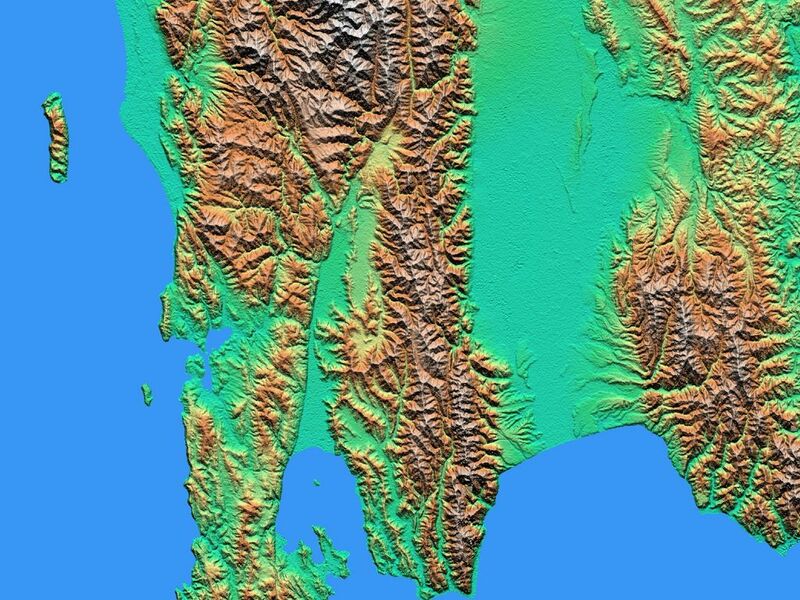 Another active fault, the Wairarapa Fault, cuts along the west side of the Wairarapa Valley (center of the image). This fault was the site of an earthquake in 1855 that may have involved as much as 12 meters (40 feet) of fault slip. 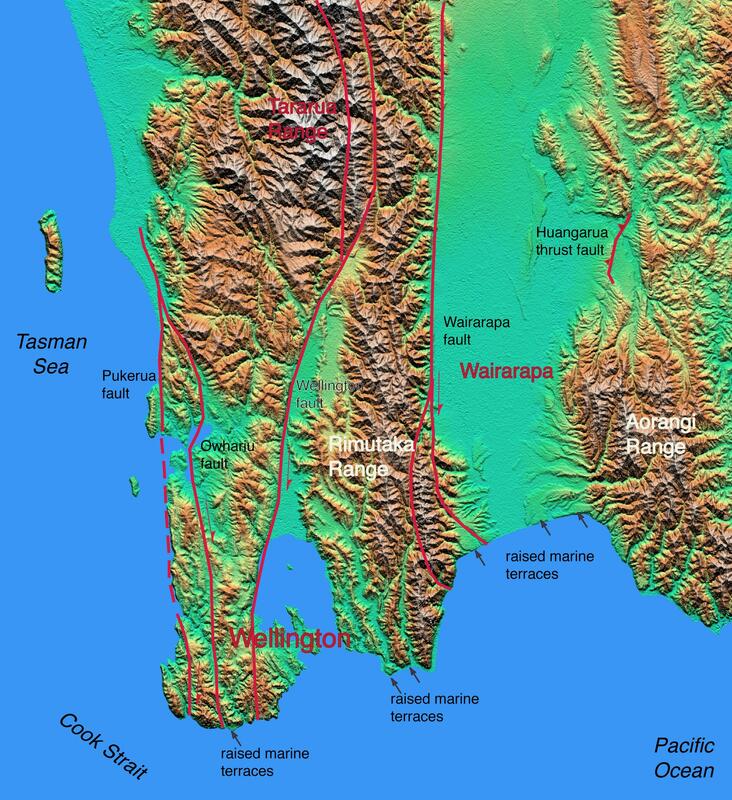 There are several marine terraces along the south coast that were uplifted in 1855 and previous earthquakes. 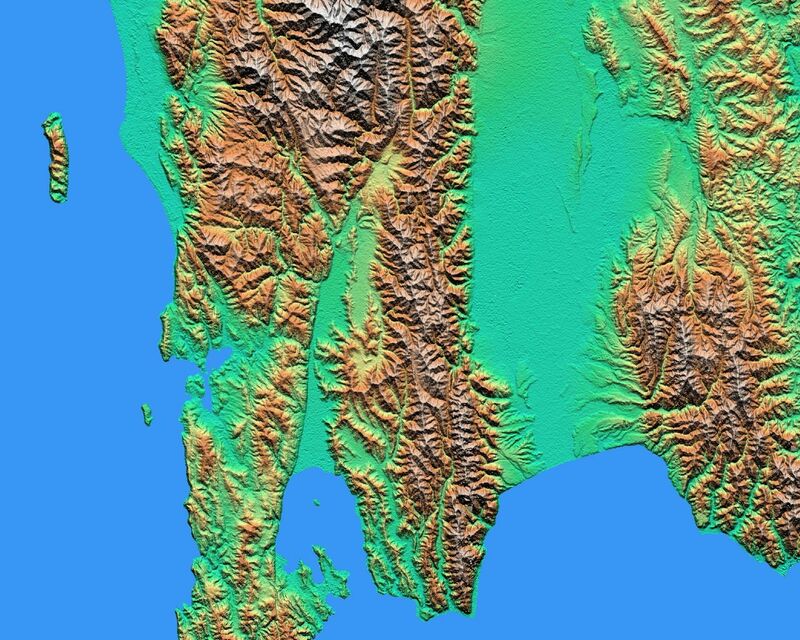 Between the Wairarapa Valley and Wellington is the Rimutaka Range, which reaches 800 meters (2,600 feet), and to the north (top center of the image) is the Tararua Range, with a peak at 1,500 meters (4,900 feet). At the right side of the image is the Aorangi Range, up to 1,000 meters (3,300 feet) high. At the bottom of the image is the Cook Strait, between the North and South Islands of New Zealand. The Shuttle Radar Topography Mission (SRTM), launched on February 11, 2000, used the same radar instrument that comprised the Spaceborne Imaging Radar-C/X-Band Synthetic Aperture Radar (SIR-C/X-SAR) that flew twice on the Space Shuttle Endeavour in 1994. 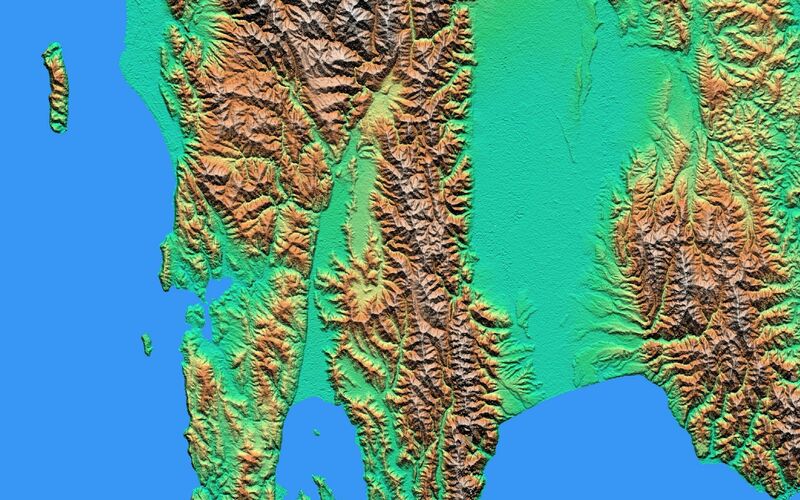 SRTM was designed to collect three-dimensional measurements of the Earth's surface on its 11-day mission. To collect the 3-D data, engineers added a 60-meter-long (200-foot) mast, an additional C-band imaging antenna, and improved tracking and navigation devices. The mission is a cooperative project between the National Aeronautics and Space Administration (NASA), the National Imagery and Mapping Agency (NIMA) and the German (DLR) and Italian (ASI) space agencies. It is managed by NASA's Jet Propulsion Laboratory, Pasadena, CA, for NASA's Earth Science Enterprise, Washington, DC.